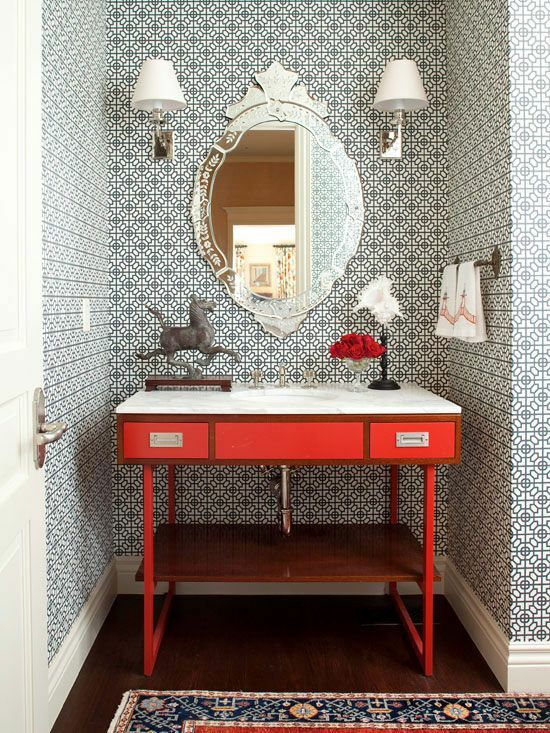 I just love the look of wallpaper, especially in a powder room! Do you have any wallpaper in your house? I don’t have wallpaper in my house anymore, but I do think the right paper in a small bath is lovely. I have The World’s Smallest Powder Room on my first floor. There’ s no chance of tricking the eye to make it look bigger, so I wallpapered it with a busy black and white motif. And put in a chandelier–the ceilings are nice and high. How small is it? My daughter says,”Mom! When you sit on the toilet you can spit in the sink!” Very. Very. Small. 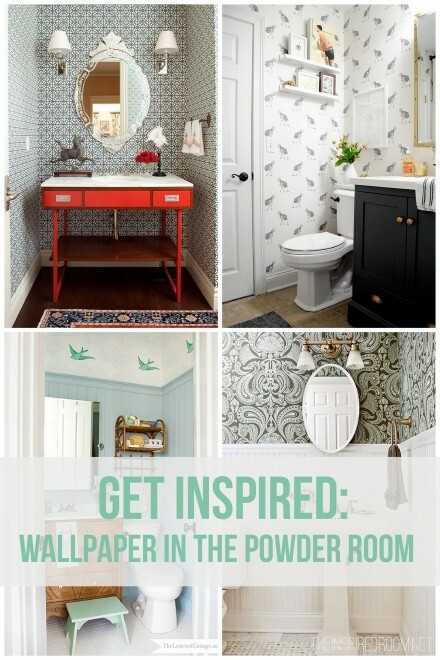 Wallpaper in a tiny room, or even a closet, looks wonderful and costs little. After spending about two weeks scraping old wallpaper off our bathroom walls, I vowed I would never use wallpaper again! But I really do love it and will probably give in some day. It really does add so much character to a room. I LOVE that tree wallpaper! I’m not a wallpaper fan and the only wallpaper I saw here that was “passable” was the tree wallpaper. All it takes is being sick with dizziness…just one time…and a lot of that wallpaper would come down in a NY second -lol-. 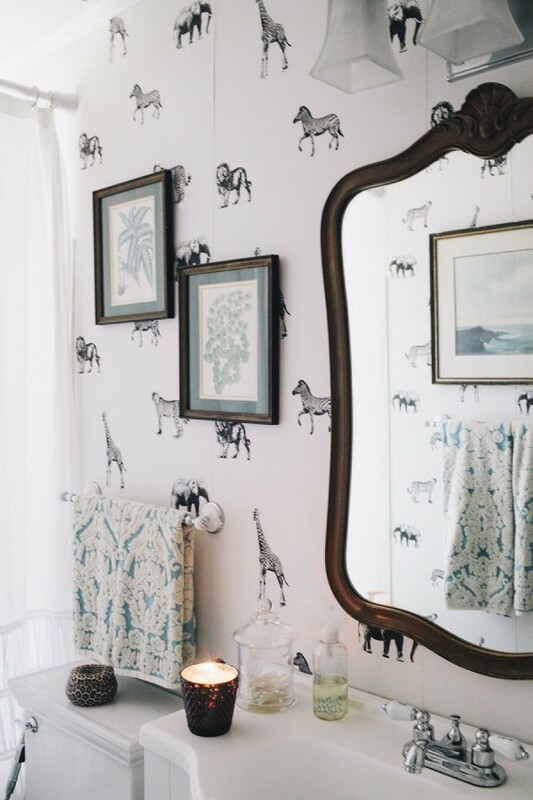 I love wallpaper in the right room and when it isn’t weird! :) And I love it in a small powder room. In 2 of our homes over the years it was a fun place to “let loose”! I have been seeing it in more post and photos recently. Is it making a come back? 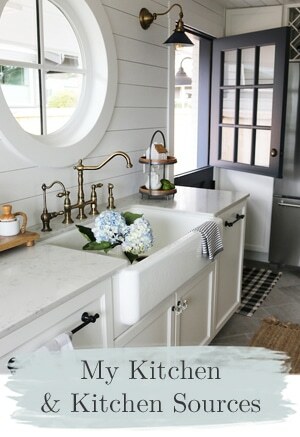 Maybe it might work for a powder room redo I am contemplating. Humm. I love wallpaper. We are restoring my grandmother’s house built in 1930s and having the hardest time finding an art deco design that would be similar to the original for the powder room. I love wallpaper! And our house is over 100 years old, so I feel like I can get away with it. I love rooms that have partial wallpaper…like above the chair rail for example. 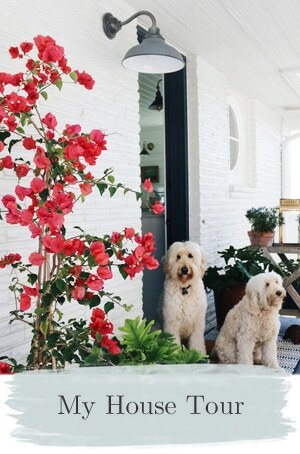 It adds an extra element to a room without being overpowering. I adore wallpaper! We only have it now in our full (tiny) bathroom and in our half-bath (also tiny) and I feel so comfy in those two tiny rooms thanks to the wallpaper. I love English style decor and they do love their wallpaper over in Britain. 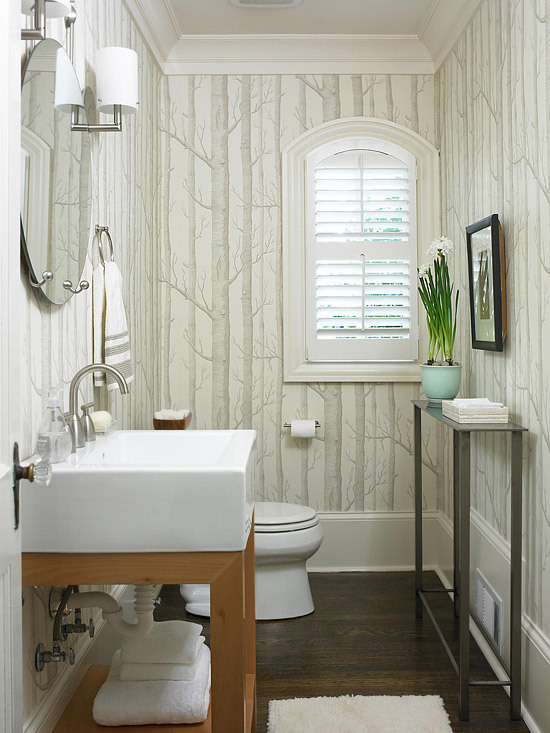 I have a barcode stripe wallpaper in my 1950’s original pink tiled powder room. The bathroom is in mint condition so can’t justify renovating. The wallpaper has shades of pink, tan/brown, blue and cream – it looks awesome!! I actually don’t hate the tile anymore since putting it up. Why, yes, we do have wallpaper here . . . + yes, it is our powder room. Tone-on-tone botanical damask from a colonial Williamsburg book. 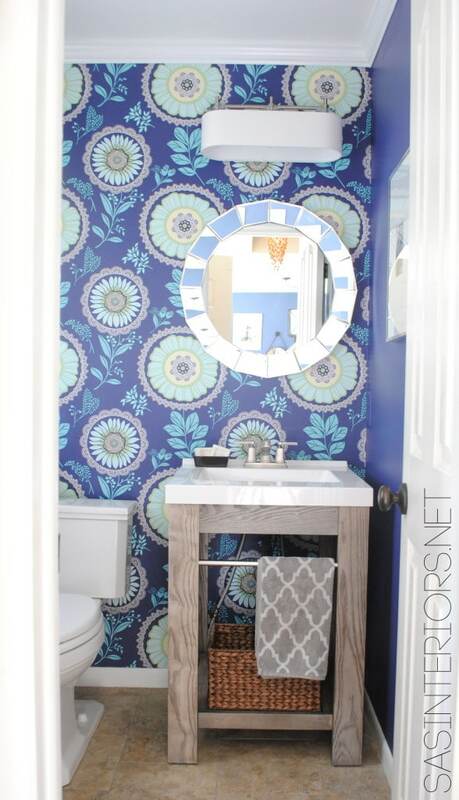 We created a brand, new space for that powder room, + I hoped the wallpaper would make it seem more original. Coincidentally, we’ve stolen a hallway + made yet another new powder room, in our current project. Yes, I’m considering wallpaper again. I love love love the brick tree paper. We’ll see. My husband hangs wallpaper (may be a dying art) and does stay busy. He does mostly remodeling jobs and very few new houses. I just had him finally take down the border in my kitchen. I have wallpaper in our bathrooms and he sure does not want to take it off, so guess I will replace it to update. Love the ideas you have here. Thanks for sharing. Had a 28-year-old border above and below in the vanity area and on some walls in the toilet area when I bought my home in late 2012. It’s gone now and won’t be replaced. 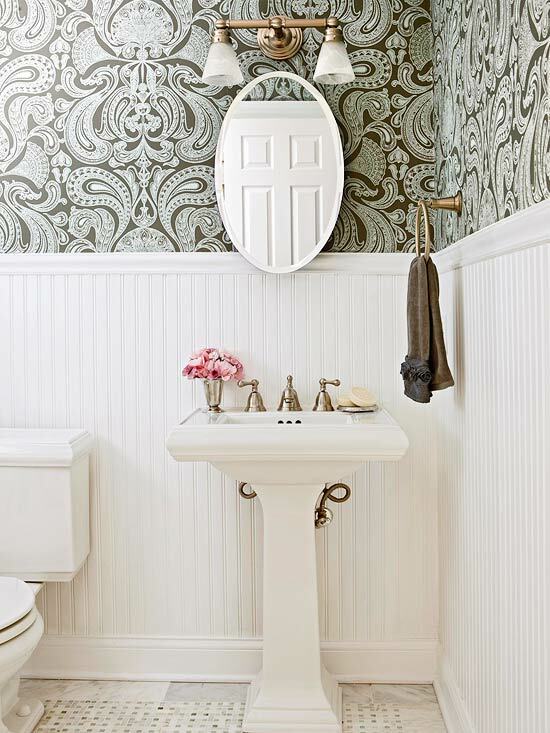 However, I’m a fan of elegant powder rooms and wallpaper is a great way to get the look. My late husbands daughter and son-in-law had the world’s second smallest powder room in their home in Portland, OR and they did the same as Kim. I used to love to use that bathroom just for the opportunity to “study” the wallpaper. Their dream home powder room in Bend, OR is much larger and more elegant but still always an “experience”. After painstakingly steaming/spraying/literally peeling, and finally, just having to texture over a 20-ft. wall of 3 layers of wallpaper…where’s my 10-ft. pole! The house had four large rooms FULL of wallpaper. Yes, I know the new wallpapers are so easy to work with and remove. 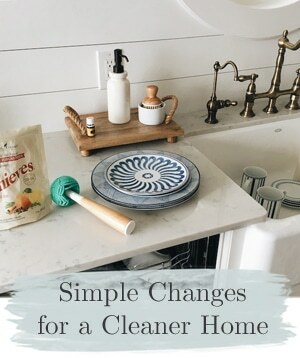 But painting is so fast for giving an almost instant new look to a room! And so inexpensively! I’ll stick with changing out paint & accessories rather than wallpaper. Did I mention one layer of that old wallpaper was flocked AND foiled in lovely orange, avocado, and gold? 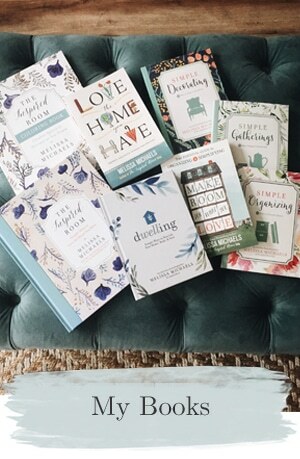 The first picture from BHG is my favorite. 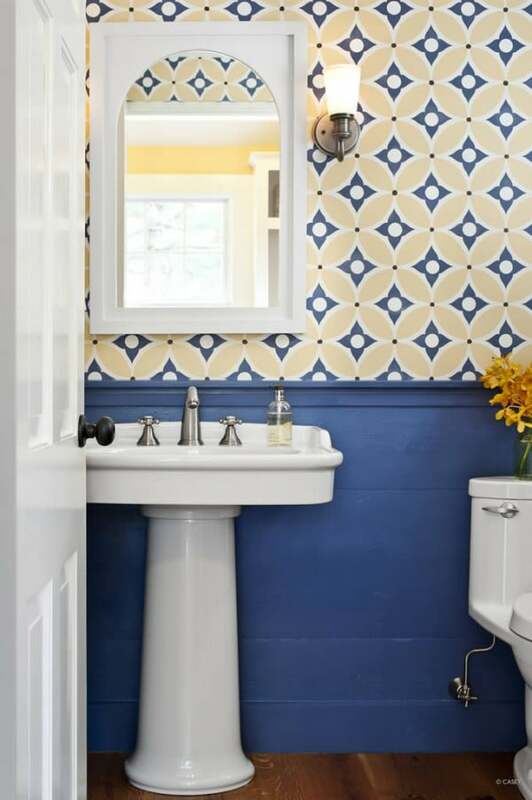 I have wallpaper in my powder room. I never had plans to have the wallpaper but found 2 rolls of Allen & Roth in Lowes for $5 each and I decided to have it in the half bath but could not cover full length on all the walls since I did not have enough so went upper half the wall with wallpaper and the lower half with paint. 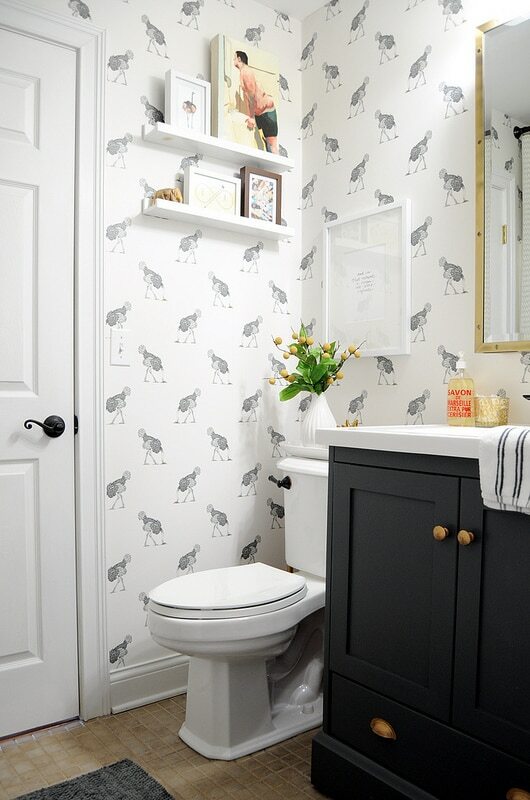 We’re renovating our kitchen and powder room this spring and I’ve already started looking at wallpaper. Cannot wait to see it done! 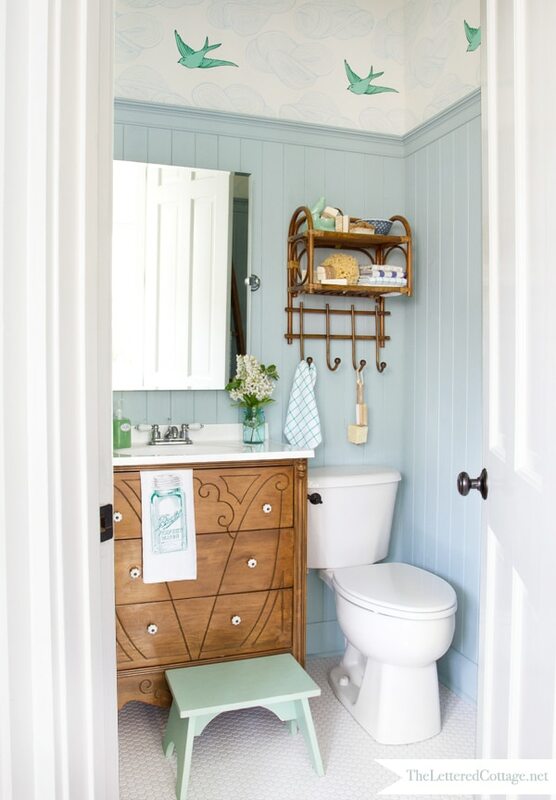 The powder room is the perfect place for it! 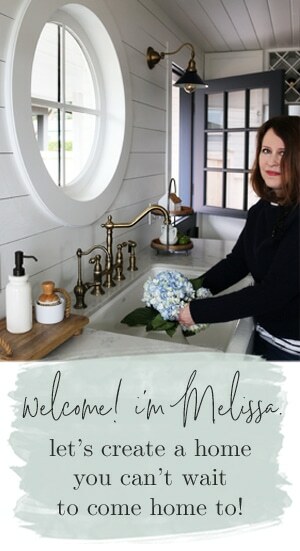 BTW – thanks for your fun blog Melissa! I’m always inspired when I check in! My powder room has floral with pink and rose. When we purchased this house 4 years ago I hated it but now it looks like a cottage garden to me and I love it! 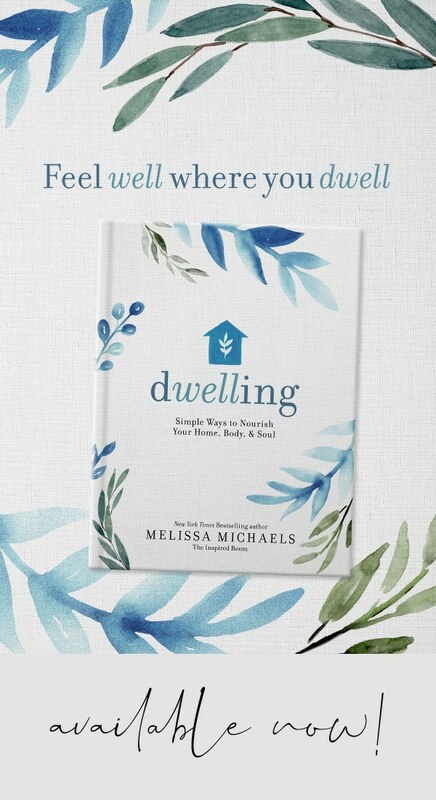 Isn’t that silly… You’re told to live with a design for a while and it’s true. Please tell me which post you had up with an attic room with slanted ceilings. It was white shiplap with a black desk and chair. My little attic room has the same ceiling with juts and crannies and I would love to do the wall just like that picture. You commented on how beautiful it was. Thanks.